Looks like a one car parade, or the last car of the parade. Nice pic Herb. Wonder where that is? I see they're advertising the State Fair on that building to the right. Not just a 1909, but one of water pump cars the first commonly refered to as the first 2500 cars, but actually they made a few thermosyphon cars before the last waterpump car. (#2,448; 2,455; 2456; and 2500 were the first, second, third and fourth thermosyphon engine cars produced. Ref page 480 - 481, Bruce McCalley, "Model T Ford" also his CD version). Note the upright crank, square front fenders, rear fenders with the fender bracket mounted evenly spaced in the fender rather than closer to the body, the brass trimmed wooden running board -- all characteristics of the first 2500 Model T Fords (ref: http://www.mtfca.com/encyclo/1909.htm). It might even be a two-lever, but from that angle, I cannot tell one way or the other. I would guess they are on the way to or back from the parade and took the photo. There are not any people on the street to wave them on, like a typical parade. I don't see a Ford script on the top radiator tank. Thought that the very early '09's had radiators with separate shells over the core, made by Briscoe, and also made by Paris for only the first early T's. Could be the Paris brand didn't have the winged script. Probably why those early Fords use a brass script on the core. What's with the upright post on the left front corner? 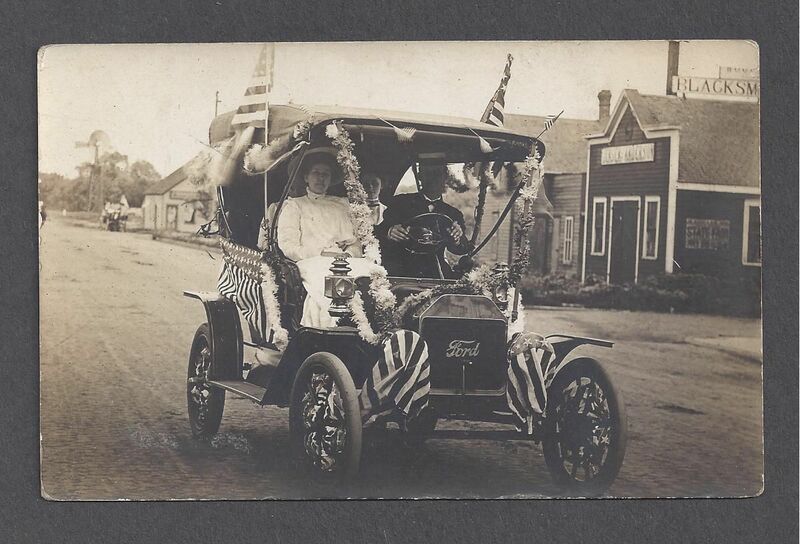 Looks about like the parade I'm in every time I drive a Model T! Notice the Linoleum covered runningboards, too. Very early. Are you talking about the top strap? I knew it was an early T, with the crank pointing up. I wasn't aware that there were some early T's without the winged script in the radiator tank. What brand do you think the sidelights are? Thank's Herb!! That is one fine picture!! Bud. How does the crank stay in the vertical position? The cowl lamps are E&J brand. Kieth, Yeah. I see now it was a strap. From the angle it looked different than the one on the right. Conversely, they could be on the way to the parade, the picture being taken beforehand. John- Re how does crank stand up. There is a plate across the sump nose that the crank handle shaft goes through and a coil spring on the crank handle rests against the plate [on it's front side an against a pinned sleeve on the crank shaft at its other end. This action pushes the sleeve it's lugs[ together with the crank handle] forward to were the protruding lugs on the sleeve go into recesses in the sump nose and holds the crank handle in a vertical position. Thanks for the explanation. I'm trying to visualize it from your description . . . I think I'm going to need a pen and paper to try to sketch this out! John----i will see if i can take a picture of same on my car. Bob, additional photos of any of your cars are always welcome! Trent Boggess has an excellent article at: http://www.mtfca.com/encyclo/ratchets.htm about the cranks used on the Ts including the first 2500 engines and those that followed. It includes the photo below and describes how the crank worked so it could be locked in the up position. Note if the engine crank in the up position in a 1909 Model T photo, it will normally mean it is one of the first 2500 engines. But the crank can also be stowed in the down position. There are some early photos of known 2500 or earlier engines with the crank handle stowed down rather than up as they are often seen on the first 2500 early Ts. Nice photo of the first 2500 T crank mechanism's. They are quite complicated. A couple of years ago I had all the parts cast from 4140 steel to make a dozen sets of them, but have not done the finish machine work on them yet. When I finish machining them I will have them heat treated. The original's if used much at all are pretty well worn. Apparently Brassworks offers radiators for the very early 1909s (serial number 1-2500) with a removable shell and/or without the Ford script. This is the only photo I have seen of a 1909 Model T without the winged Ford script. Actually the description from Brassworks lists the 'with out Ford script' for the T #1 to 299.